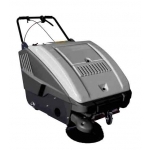 The walk behind powered vacuum sweepers are ideal for small to medium areas. 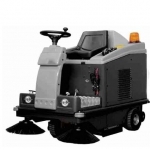 They have excellent sweeping capabilities and steering manoeuvrability and are available with various sweeping widths. 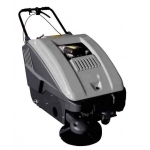 The ride on machines are better suited to the serious user who wants to clean medium to large areas such as stores, public areas, garages and car parks. 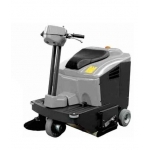 They utilise variable hydrostatic driven front wheel steering and boast an extremely small turning circle. The brushes supplied work well on every kind of surface; heavier duty brushes are available on request, to meet more demanding cleaning requirements.